Each Wednesday, one Livermore Valley will kick off "Winery of the Week" by hosting Wine Wednesday. The winery will be open on Wednesday from 5-8pm to help guests wine-down from a hefty work week, or just grab a taste of wine before heading out to a fabulous dinner! March 20-24: Event Weekend; Barrel Tasting Weekend! July 24-28: Event Weekend; Taste our Terroir! Aug 28 - Sept 1: Event Weekend; Harvest Wine Celebration! 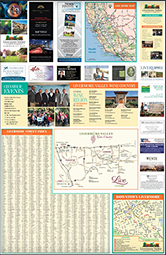 Various Livermore Valley Wineries, visit https://www.lvwine.org/event/4626/wine-wednesday-winery-of-the-week for the full list. Winery of the Week kicks off on Wednesdays, and the fun continues all weekend long with each winery hosting a variety of activities. Tasting fees vary per winery.